In France the Bibliothèque of the Touring Club de France contains a hundred entries under the caption "Automobiles," besides complete files of eleven leading journals devoted to that industry. 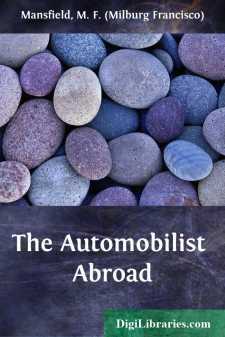 With these two sources of information at hand, and aided by the records of the Automobile Club de France and the Automobile Club of Great Britain and Ireland, the present-day historian of the automobile will find the subject well within his grasp. "A look of anguish underneath the car,Another start; a squeak, a grunt, a jar!The Aspiration pipe is working loose!The vapour can't get out! And there you are!" "Strange is it not, that of the myriads whoHave Empty Tanks and know not what to do,Not one will tell of it when he Returns.As for Ourselves, why, we deny it, too."